When I visit Buenos Aires I am usually housed with Misael Payares, the president of the association. He is pictured here with his grandchildren (clockwise from top left) Maicol, Malbi, Cheila, and Juan Manuel. 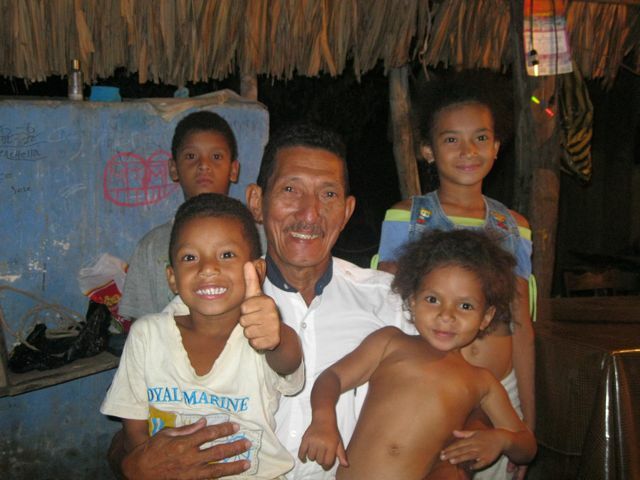 The children are being raised by Misael and his wife Edith because their mother is in Bogota where she could find work. The father not around. The oldest daughter of Misael lives in Washington DC. Their youngest, Shelly, lives with them and helps with the kids. Two sons live in the village. Another adult daughter who is mentally ill, plus deaf and mute, lives with them and walks backwards around the family compound most of the day avoiding all human interaction. Edith and Shelly team up to do household management. 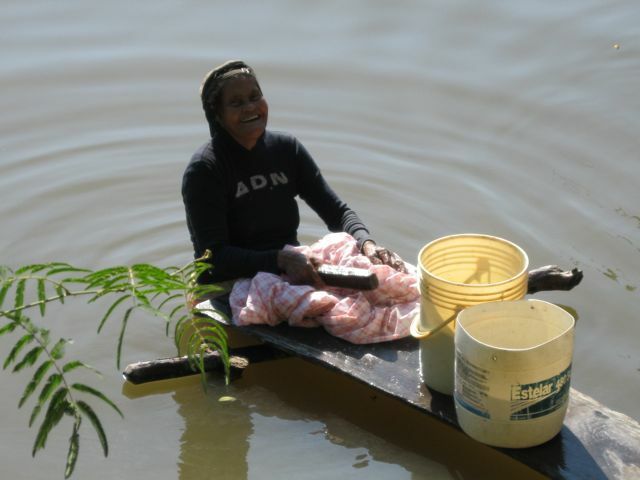 Clothes are washed in the river next to the house. That's Edith at the laundry plank. All other water is hauled from the river in five-gallon containers for bathing, cooking, dishwashing, drinking, and bucket-flushing the toilet. Drinking water is boiled. Bathing is done in the river or in the tiled bathroom with a pan of cold water. 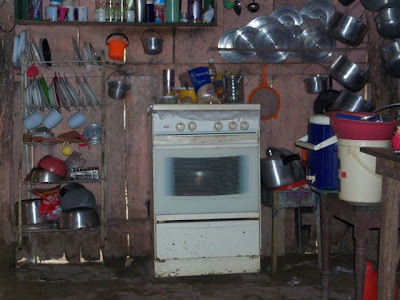 The picture here shows part of their kitchen, the nicest I have seen in Buenos Aires. The range hasn’t worked for several years. They have a refrigerator and a TV with local channels. 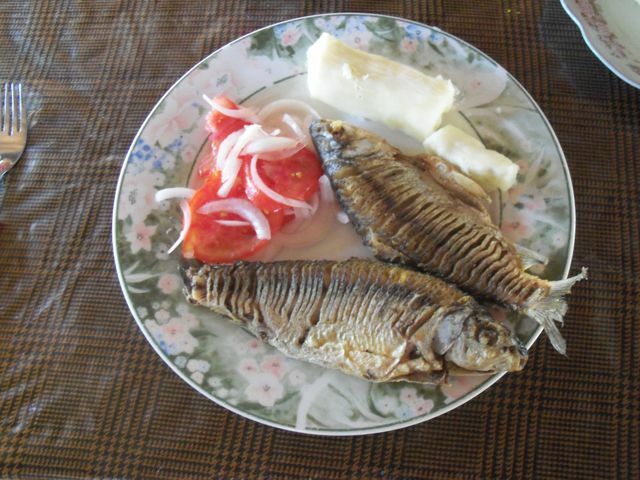 Meals of preference in Buenos Aires would start with hot soup, then move to rice, yucca, maybe an in-season vegetable, a variety of sweet cold drinks, and some kind of meat, often fish, as in this photo. Lots of fruit is eaten, mostly as juice or between meals. I can’t name most of them. Edith makes the kids school uniforms from scratch. Here, Shelly is prepping Malbi’s hair for school. The picture doesn't do justice to the fully pleated skirt. The compound is comprised of two small houses with tin roofs and cement floors separated by a huge kitchen/dining area with thatch roof and dirt floor. Dogs, chickens, and Felipe the grumpy parrot are always underfoot in that area. The tortoise corral is there, too. A six by three foot area with eighteen-inch high walls holds six to ten tortoises waiting to become stew. I’m pretty sure it is illegal to hunt them. The foot and tail section I ate last week wasn’t too bad, but I really was not enthusiastic about the boiled tortoise egg. Travel in and out of the community happens via about 12 miles of dirt road and 8 miles of cow path on motorcycles in the 4-month dry season. During the rainy season and for all heavy items, things come in on the river. This year the rain season lasted a month longer and ended with a big flood in December which had two to three feet of water in most houses for about a month. Most of the seasons crop were lost, and there is a serious food shortage for small farm families in much of the region. You can see the water damage on the wall behind the shoulder of my co-volunteer, Gladys, in this photo. 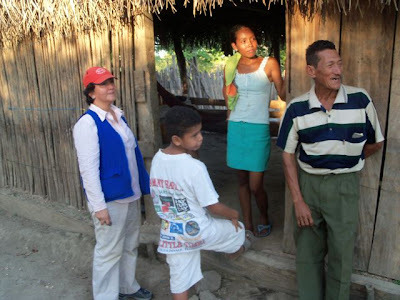 Last year I visited and wrote about why we have been accompanying the one hundred-plus families of Buenos Aires, Santander, Colombia. They have been organized into an agricultural “association’ for more than ten years, and have been working to gain titles to about 6,000 acres of farm, forest and wetlands through a federal program called Las Pavas. A federal law passed in 1994 allowed the transfer of title of abandoned agricultural tracts into parcels no bigger than 150 acres. In June 2006, INCODER the federal office overseeing this program sent two officials who spent four days evaluating and confirming the community’s eligibility and the development they had completed to that date. The preliminary response was that everything looked good. Two years later a relative of the former owner sold the property to a palm oil consortium after running the community off the land with paramilitary thugs. INCODER, which had been sitting on it’s own report said nothing. Early in 2009 the families re-entered the property in an attempt to create a legal presence. 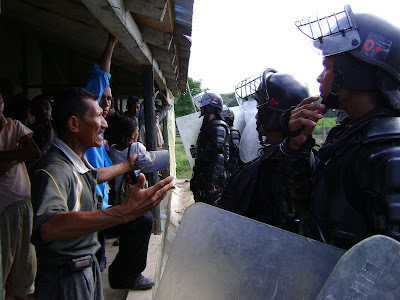 There were a flurry of contradicting judicial and municipal orders sent out, and on July 14, 2009 the community was again evicted, this time by a squad of riot police. That is the short, sanitized, simplistic summary of what happened up to the point CPT got involved with accompanying these folks. Since then, the have been receiving help from several Colombian and international groups regarding legal issues, community development, food security, and human rights advocacy. One of the hot-button talking points for this conflict has been that fact that one of the members of the palm oil consortium, Daabon Organics, was supplying palm oil to the fair trade international beauty and cosmetic retailer, The Body Shop. Mission statements of both Daabon and The Body Shop contradict the manner in which the land was acquired and the manner in which it is being developed. While Daabon denies this vehemently, The Body Shop participated in a jointly sponsored commission with Christian Aid last year, and as a result stopped purchasing from Daabon. The commission report was exhaustive and is a good read if you want to understand how deeply complicated the Las Pavas conflict is. Things are reaching a crucial point as the community plans another entry into the property in an attempt to force the judicial system and INCODER to quit stalling make ruling. In my next and final reflection for this year’s trip I will try to flesh out some of the complex moral, legal, and theological layers we are trying to wade through. Also, the Las Pavas community is featured in this short, excellent video. 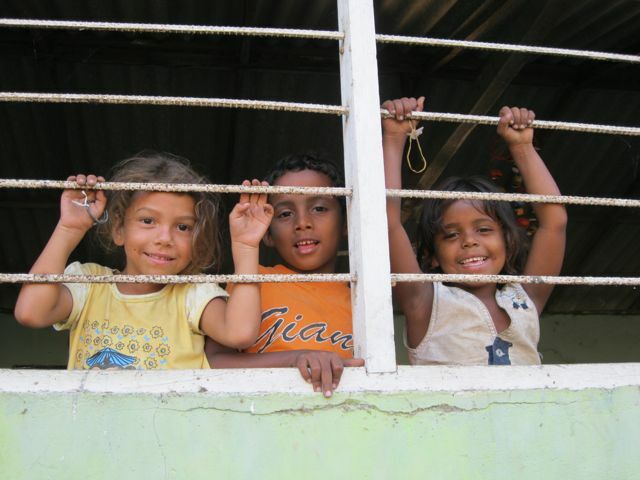 Three communities are profiled, Buenos Aires is the second. You'll need to copy and paste these addresses into your web browser as I haven't figured out the link option yet. Sorry.